Postal librariana bridges two worlds - the world of postal history and the world of library history. The government issued postal card is a good example of this. Although postal cards are by their very nature ephemeral, they sometimes contain a significant amount of information pertaining to both postal history and library history. They also provide evidence of how libraries conducted library business on a day to day basis. The card below is a 1914 issue United States postal card. It was first issued by the Post Office on June 4, 1914. It is one of an astounding 58,536,261,000 cards of this type issued by the Post Office during its official period of sales. The Scott Catalog assigns the number UX27 to this card. The United Postal Stationery Society assigns the number S37. These cards were sold by the Post Office as single cards and in sheets of forty cards. Sheets could then easily be printed with a standard message similar to the one on the reverse of this card. The front side of the postal card which was sent from the United States to Austria and was then reused for the return message to the United States. The card was originally addressed to St. Petrus Claver – Sodalitat in Salzburg, Austria. The Sodality of St. Peter Claver is a missionary society established to aid African missions. It published Bibliotheca Africana. The original address has been marked through and then addressed to the Periodical Dept. of the Univ. of Illinois Library. 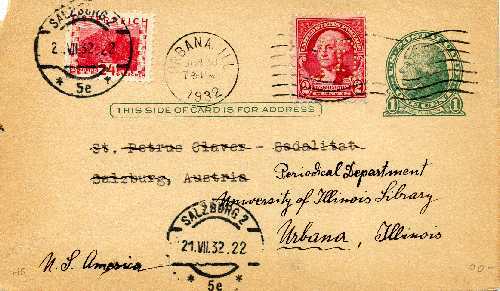 The U.S. postmark indicates that the card was mailed on June 30, 1932 from the Post Office in Urbana, Illinois at 7:30 p.m.
A 2 cent postage stamp has been added to the postal card to achieve the correct 3 cent international postal card rate. 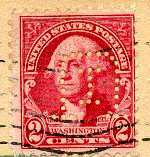 The stamp is one of the stamps in the Washington Bicentennial set of stamps (Scott # 707). It has been perforated with an upside down "U" with an "I" inside which stand for the University of Illinois. The stamp is considered to be a "perfin" which stands for abbreviated initials. This was a technique used to protect an institution from misuse of its postage. The Austrian postmark indicates that the card was mailed back to the United States from Salzburg, Austria on July 2, 1932. A 24 groschen stamp (Scott # 344) was used to pay the correct international postal card rate to the U.S. The reverse of the card shows that it was a request from the Periodical Department of the Univ. 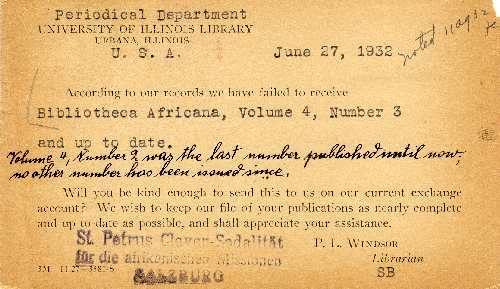 of Illinois Library for the most recent issue of the periodical Bibliotheca Africana. The card bears a printed signature for P. L. Windsor, the Librarian who served as director of both the Library and the Library School from 1909 to 1940. A staff member with the initials SB actually mailed the card. A reply written on the same card indicates that there is not a more recent issue of the periodical. The card is stamped St. Petrus Claver – Sodalitat fur die afrakanischen Missionen. Return to the Postal Cards and Libraries page.